Seagate has introduced new hard drives for Network Attached Storage (NAS) devices: the 14TB IronWolf and 14TB IronWolf Pro HDDs. The new models offer users access to high-performance hardware alongside management and recovery tools, making it possible to upload and download large amounts of data remotely without stressing about drive failures. Both the 14TB IronWolf and IronWolf Pro models feature Seagate's AgileArray technology, which optimizes the HDDs for multi-drive storage systems. Both models also offer up to 256MB cache, but the IronWolf Pro has a longer mean time between failures (MTBF) of 1.2 million hours versus the IronWolf's 1 million hours. As well, the 14TB IronWolf comes with a 3-year warranty, whereas the IronWolf Pro has a 5-year warranty. The regular IronWolf model is targeted at small businesses and home use with a 180TB/year workload rating, while the IronWolf Pro is intended for creative professionals, among others, with a 300TB/year workload rating. Both the 14TB IronWolf and IronWolf Pro feature rotational vibration sensors, but differ in support for multi-drive configurations: the IronWolf can be used in devices with up to 8 bays and the IronWolf Pro can be used in devices with up to 24 bays. The Pro model includes data rescue services, which are an optional addition for the IronWolf model. 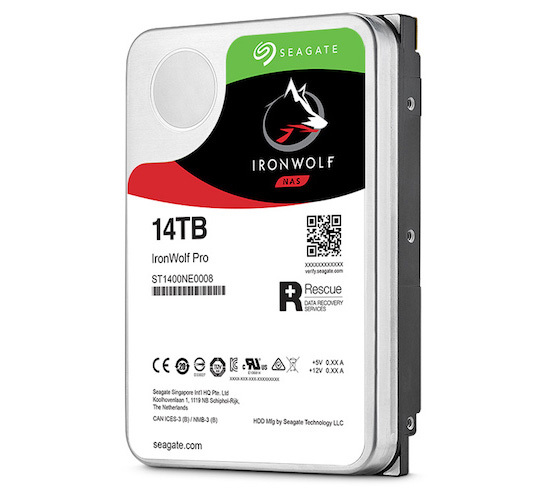 Seagate's IronWolf product page doesn't currently include the 14TB model in its retailer availability search, but Tom's Hardware reports that the 14TB IronWolf costs $530 USD and the 14TB IronWolf Pro costs $600 USD.